Say the words “goat cheese” and I am all in! This recipe for Crispy Chicken with Goat Cheese & Sun Dried Tomatoes takes your plain old chicken to flavor country! 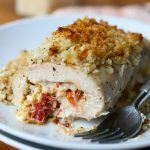 It is a boneless skinless chicken breast, pounded thin, and filled with a mixture of goat cheese, mayo, garlic, and sundried tomatoes. It then gets rolled up and topped with a crunchy panko breading mixture. My husband does not feel the same way as I do about goat cheese. He wants nothing to do with it…but he loves fish and I want nothing to do with it- so we are even! Last time he was out of town I made a couple of these and ate them the entire time he was gone. And I loved every single bite! Place the chicken in a ziplock bag on a hard surface. I use a meat tenderizing mallet like the one linked here, or you can use a wooden rolling pin to pound the chicken to the desired thickness, 1 breast at a time. 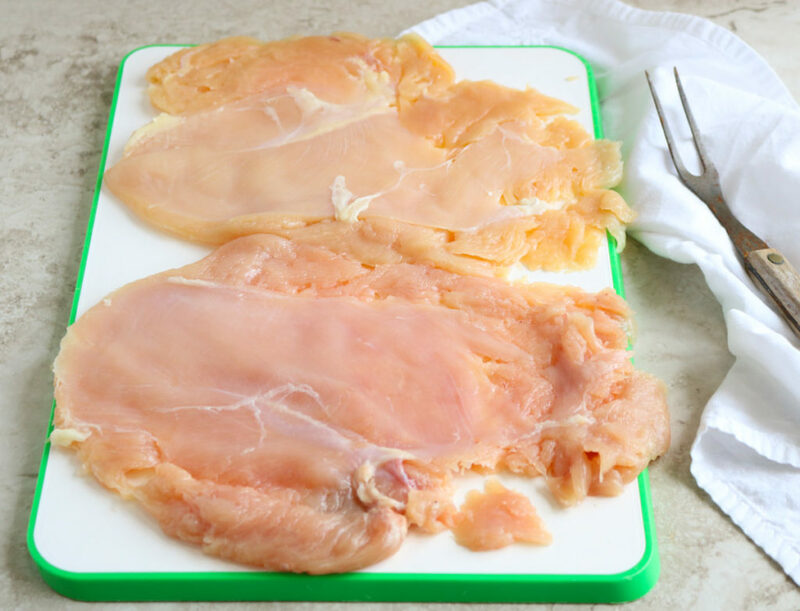 Place the chicken on a solid cutting board and cover the top of the chicken with plastic wrap. Pound the chicken to the desired thickness using a meat mallet or wooden rolling pin. Make the goat cheese and sun dried tomato filling by mixing together the mayo, goat cheese (it will be easier to mix the goat cheese if it is not straight out of the fridge), fresh garlic, sun dried tomatoes, basil, and a pinch of salt & pepper. You can set that aside for now. I like to do the next couple steps right on the foil lined sheet pan that you will bake on. It makes it way easier and less clean up…. something we all like, right!? 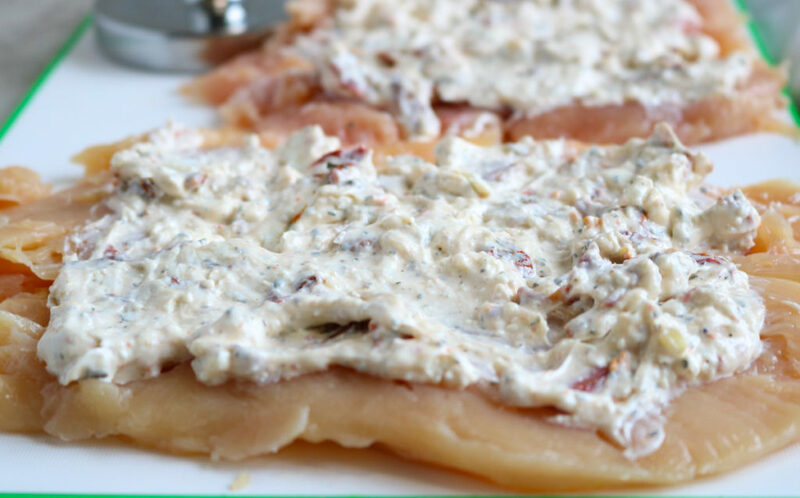 Lay the chicken breasts flat and spread a few tablespoons of the goat cheese mixture over the chicken. Roll the chicken breast over the filling, lightly, making sure the filling does not squeeze out of the sides of the roll up. Place the breasts seam side down on the sheet pan. It is ok if some of the cheese mixture gets on the pan while you are rolling them up. It is a messy process, but I promise it turns out beautiful. Some of the filling will spill out during baking process and it gets all golden and gooey…. those are the super delicious parts you will want to make sure and serve with the chicken…. or sop up with a piece of bread. Now season each chicken roll up with a little olive oil and salt and pepper and pop it in the oven for 15 minutes. While that cooks you can put together the super delish crispy topping. It couldn’t be easier, you stir together the 4 ingredients and season with a little salt and pepper. Make sure the mayo is distributed evenly in the panko bread crumbs. 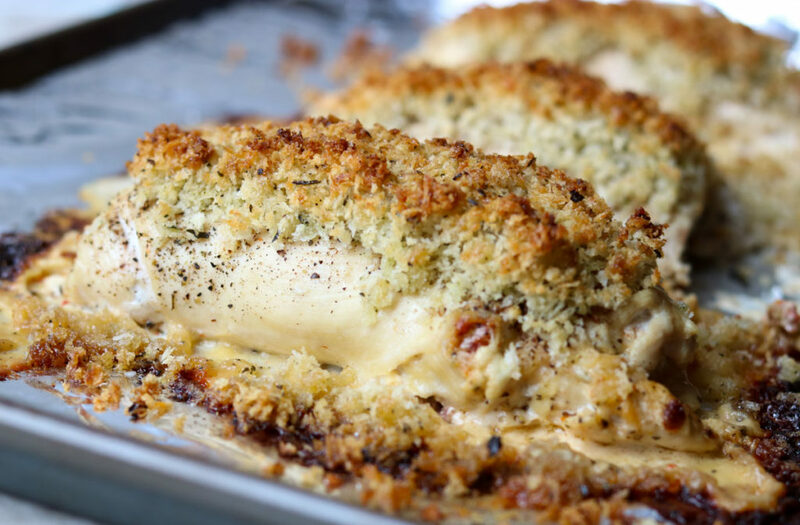 Pull the par cooked chicken out of the oven and top each breast generously with a HEAP of the panko bread crumb mixture. Carefully put the chicken back into the oven for an additional 10-12 minutes until the topping is golden brown and crunchy. Panko bread crumbs are the traditional bread crumbs bigger brother. Where traditional bread crumbs are processed into a finer powder, the panko crumbs are a bigger, drier, and crunchier. Can I use regular breadcrumbs instead of panko bread crumbs? The answer is unfortunately no, for this recipe. I am sure there are a lot of recipes that the two are interchangeable but this is not one of them. You want the light crispy texture of the panko crumbs. Add toasted pine nuts to the goat cheese mixture for a little nutty crunch. Get your greens by adding spinach. I would recommend using frozen- thawed spinach that has been completely drained of liquid. Then add it to the goat cheese mixture. Put a few chopped artichokes in the goat cheese mixture. Crispy Chicken with Goat Cheese and Sun Dried Tomatoes is pretty filling so no need to go crazy with the side items. I like to make a Caesar Salad and my Oven Roasted Asparagus or Lemon Garlic Green Beans. 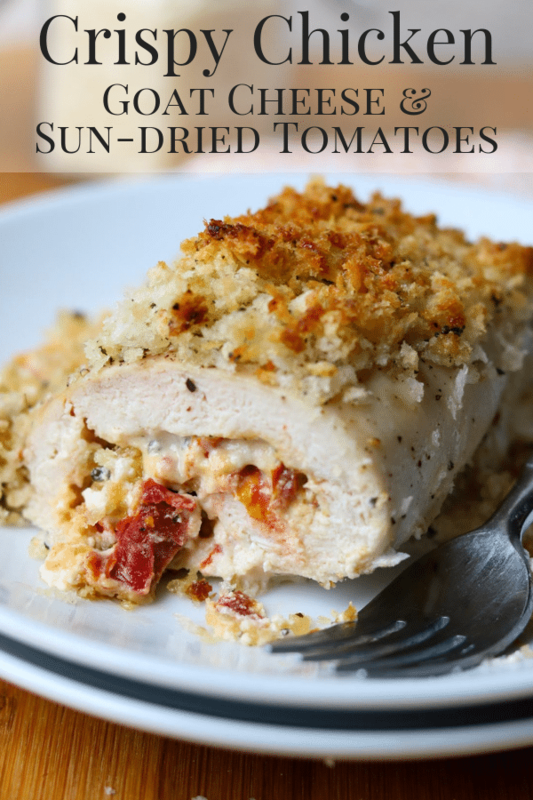 This Crispy Chicken with Goat Cheese and Sun Dried Tomatoes made a great dinner during my photo shoot- I couldn’t resist! I cannot tell you how much I love it when people message me, email me, or write a comment that they made my recipe (and loved it). It truly makes my day. Save this recipe now, so you don’t have to look for it later! Pin it here. 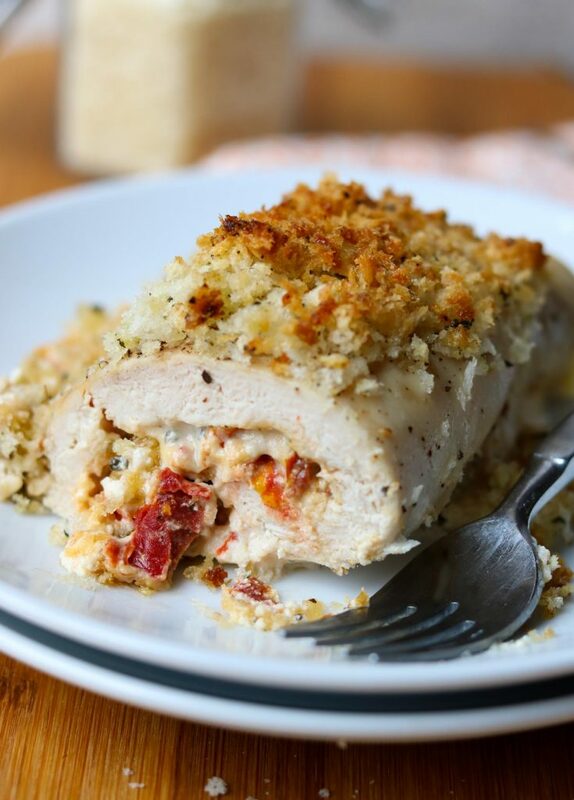 A delicious baked chicken breast stuffed with a tasty goat cheese and sun dried tomato filling, topped with a crunchy panko breading. Pound the chicken breasts to about 1/4 inch thickness with a meat mallet or rolling pin. Set aside. In a medium bowl mix together all the ingredients for the goat cheese filling. Stir until it is well combined and there are no clumps of goat cheese remaining. 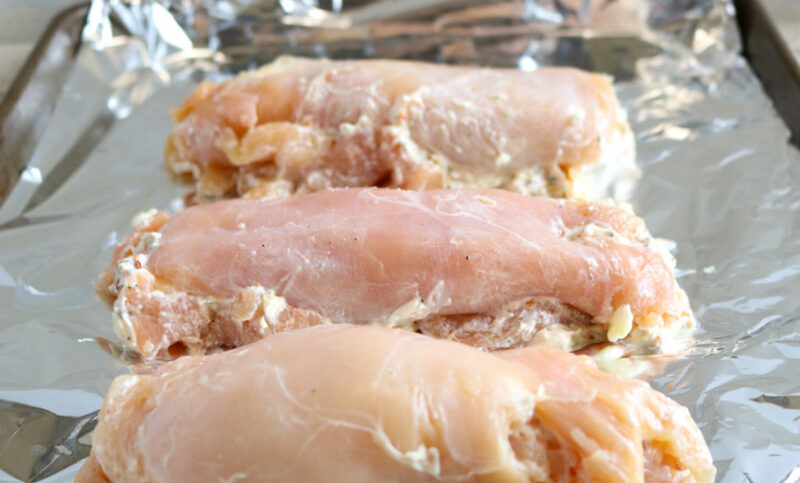 On a foil lined sheet pan lay the pounded chicken breasts out flat. 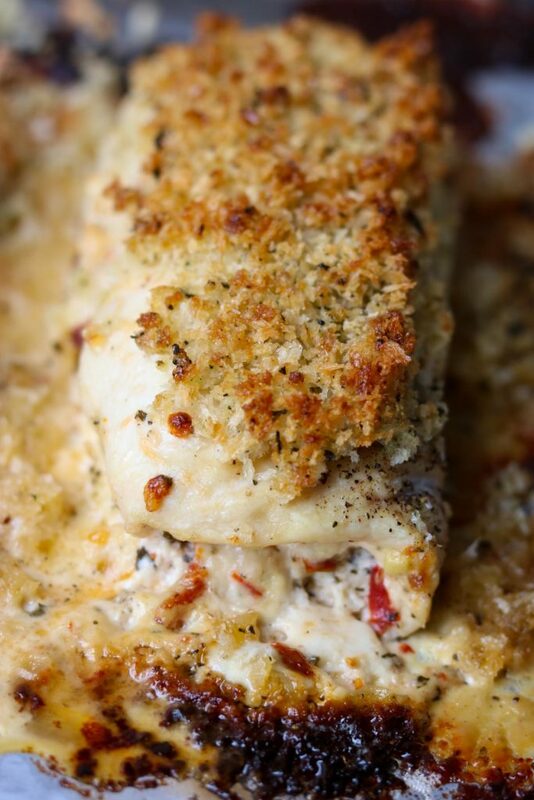 Spread a few spoonfuls of the goat cheese mixture evenly over the flattened chicken breasts. Lightly roll the chicken over the filling, like a burrito, try to keep all the filling inside the chicken roll. Lay the chicken rolls seam side down on the pan. *** This will be messy, but don't worry it will turn out beautifully! Season the outside of the chicken with a drizzle of olive oil and a sprinkle of salt and pepper. Place the chicken in the oven for 15 minutes. Meanwhile, in a small bowl mix together the ingredients for the Crunchy Topping. 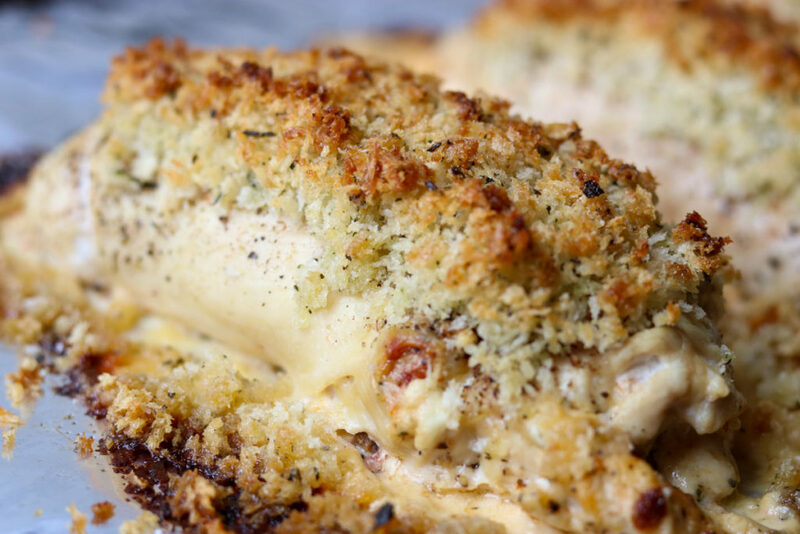 Remove the chicken from the oven and top it generously with the panko bread crumb mixture. You want this to be a pile of crunchy topping on each chicken breast. Carefully place the chicken back in the oven for an additional 10-12 minutes until the topping is golden brown and crispy and the chicken is cooked thru. ** When you serve this dish make sure to scrape up all the bread crumbs and filling that spills out during the cooking. Those ooey-gooey-cheesy-crispy-bread bits are the best!!! This was delicious, and easy to make. I had to cook it for 10 minutes longer, but I made the mix for four pieces, and put it all into two pieces. this chicken is great…making it my second time tonight! love the filling and the topping….only thing is my oven is off and I need to cook a little longer..but no big deal!!! worth waiting for! I’m with you on the goat cheese! (And I’m also out on the fish- ha!) I’ve never tried making stuffed chicken, that needs to change! I made this recipe the other night and there were no leftovers! Love it will absolutely make it again! Thanks! This was delicious!! A hit a my dinner party! Looked like I slaved all day but it was pretty easy! The recipe got rave reviews!! Do you add chopped artichokes with the tomatoes or leave tomatoes out? Tried these tonight; quick & easy and absolutely delicious! This recipe is going in the book! I did use garlic paste from a tube though and didn’t actually completely lose all goats cheese chunks but it worked out great. Thank you!!! also your star rating didn’t work for me- I can give a max of 3 star in safari?! I would give 5!! I am so glad you made it and loved it!!!! Thank you so much for letting me know! I’m glad you told me about the stars… I will check on that. I changed recipe cards recently so maybe things got messed up. This looks and sounds amazing! Definitely going to try cooking it this week. Anything with sun dried tomatoes is delicious! Thank you!! I hope you love it! I love sun dried tomatoes too (and goat cheese). This sounds amazing and packed with flavor! I’ve got the itching to try new recipes. 😉 Where could I get goat cheese? This is a great one to try! I usually get my goat cheese at Aldi or Trader Joe’s , but you should be able to find it in just about any market. I buy mine in little 4oz logs. 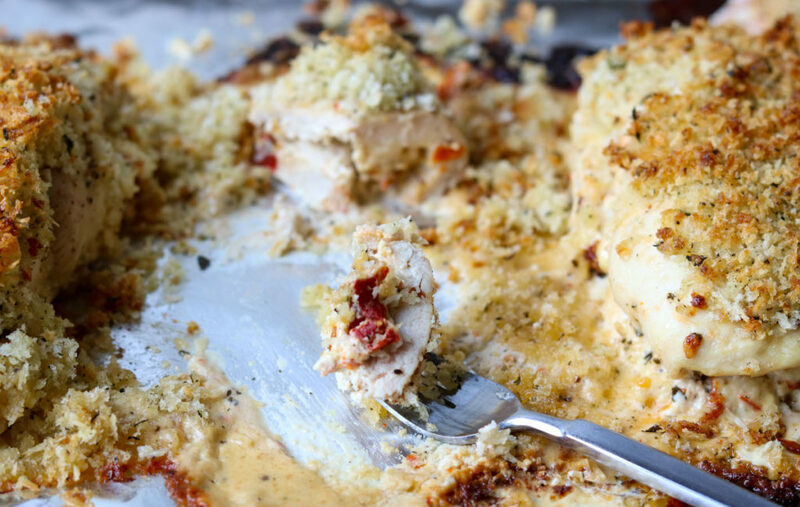 This is such a great way to stuff chicken and kick things up with weeknight dinners! Definitely works for weeknights, or weekend family dinners, or entertaining! I adore goat cheese (though I adore fish too, so if you and your husband ever need a culinary mediator, let me know, haha). It’s been so long since I did a recipe like this, but I’m honestly not sure why now. It looks so delicious and simple, and it nicely stands along the fence between weeknight-easy and company’s-coming fancy. My favourite kind of recipe. What?!!! How can the hubs not like goat cheese. It just adds so much more elegance to plain old chicken & has the power to make a salad all the more special. Loving what you did with it. I can see why you indulged on this while the hubby was away. I love it more than anything , especially because I don’t get it very often. I hope you give this recipe a try. It is divine! Lynn- I just looked at your site and it is SO beautiful. What an inspiration. Your photography is amazing! Now THIS is a winner winner chicken dinner. Dang, I seriously need to make this asap!! I am with you, goat cheese makes everything better. Plus I add sundried tomatoes to as many dishes as I can. What a yummy way to take a traditional chicken dish up a notch.